Raised in an orphanage in Metrobay, Swan Starling has no idea who her parents were or their lineage. Once she was old enough to be on her own she bounced around from one low paying street job to another. She later befriended a woman named Prudence Goodheart who got Swan a job working as a cleaning maid at the huge Strangecraft lighthouse tower mansion. Lord Strangecraft spent his time investigating mysteries of the occult and magic. He detected a magic aura about Swan he could not explain. It was in 1886 that Swan discovered her true calling when a winged angel visited her. The angel was actually Avia, the bird goddess. 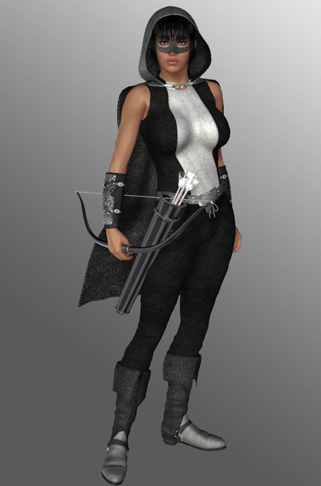 Avia had chosen Swan to wear the feathered cloak and become the next Nightengale: a heroine devoted to fighting evil, especially the evil of the black crown. The black crown was now known in the Victorian era as the Black Hat. Swan knew of the Black Hat from working with Lord Strangecraft. The Black Hat worked with a coven of witches trying to enshroud Metrobay with their dark magic. So, Swan graciously accepted Avia’s gift and their combined power repelled the dark age from becoming reality. And so the Nightengale of the industrial age was born. When she donned the feathered cloak, Swan transformed into the masked Nightengale. She was able to fly and was gifted with supernatural strength. She kept her identity a secret from the public. Only Prudence and Lord Strangecraft knew her alias. During the Victorian era Swan fought not only the Black Hat but also the warlock Bert Rayal, the witch Sheridan Fox and the calculating Draven Ophidian to name a few. She also often teamed up with other heroines such as Calico Kitty (Karen West), Puma Pistolera and Paw-Paw. In the early 1900’s, many of Swan’s friends like Prudence were aging and had retired from crimefighting. But, the magic cloak kept Swan ageless as long as she continued taking up the cause of the Nightengale. Her friendship with the equally ageless Karen West continued. She would later befriend a new stock of heroines and face new villains as well as the long-standing fiends who used black magic to also avoid the effects of aging. It was in the 1940’s that Swan joined the newly formed Superheroine Squad that was started by Ms. Metrobay, the daughter of Swan’s friend Karen West. At this time the once small criminal organization Circle of R.O.P.E. had developed into a major threat and became the primary enemy of the superheroines. For nearly 120 years Swan had fought the good fight and it was time to hand off the feathered cloak to a new heroine. With Avia’s guidance Swan found Samantha Sable who took up the mantle of Nightengale. Once Swan Starling relinquished the feathered cloak, her body instantly aged. Shortly afterward, Avia took Swan by the hand leading her to the big bird nest in the sky. She had helped keep Metrobay safe from many villains and made many friendships in countless adventures.